The preliminary estimates are saved in the data set Prelim, as shown in Output 4.25.1. The data set ParmEst contains the maximum likelihood estimates and (as well as ), as shown in Output 4.25.2. 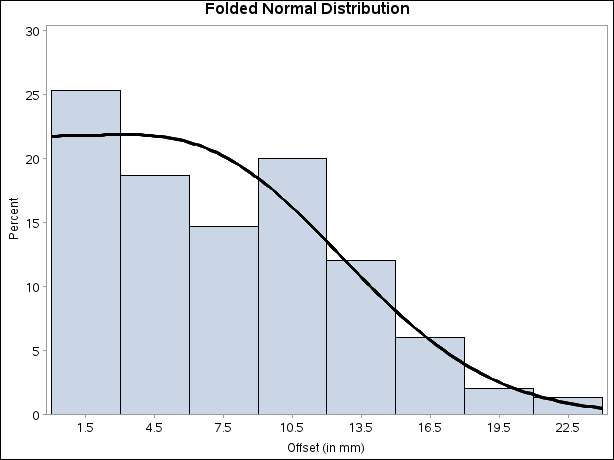 To annotate the curve on a histogram, begin by computing the width and endpoints of the histogram intervals. The following statements save these values in a data set called OutCalc. Note that a plot is not produced at this point. Output 4.25.3 provides a listing of the data set OutCalc. The width of the histogram bars is saved as the value of the variable _WIDTH_; the midpoints of the first and last histogram bars are saved as the values of the variables _MIDPT1_ and _MIDPTN_. Output 4.25.4 displays the histogram and fitted curve. A sample program for this example, uniex15.sas, is available in the SAS Sample Library for Base SAS software.